Come one and come all — try out your speed and tactics against other boats and other classes in a distance race on the river on Sunday, June 18. We will use government marks and the course will be determined by weather conditions on Sunday. The NOR, Sailing Instructions, and Course Diagrams are all posted below. Scoring will be done using the Portsmouth Yardstick system. Questions should be directed to the PRO for the Distance Race, John Van Voorhis. The sky was partly cloudy and the breeze was a gorgeous 13 mph or so from the south. The weather reports predicted a storm from coming through at about 2 or 3 pm, so we started the races a bit early (11:11 am) and chose a course of a moderate length. Four boats competed in the re-instituted distance race. They started off of the green can (G7A) east and south of the marina and raced around red nun just north of the bridge (N2), back up to the bifurcation buoy that marks where the channel splits between the Anacostia and the Potomac and back to the start — about 9 nautical miles. Chris Porter was out on his Buccaneer but did not race because he did not have a crew. John Ely was out on his Hobie-16 but did not race because his old boat has a bent mast and can’t point. A sailor on a Laser (178xxx) was also out their having fun. Stew Harris was on land working on yet another resurrected I-20. Will Phillippe was also there working on both of our Skiffs. The RC was staffed by Frank Gallagher, John Kirchner, Chessie the sea monster (see pictures), and myself. Thanks to John for his pics and to Barney for the pre-race pic! On June 12 we have a special event: the resurrection of the PRSA Distance Race! 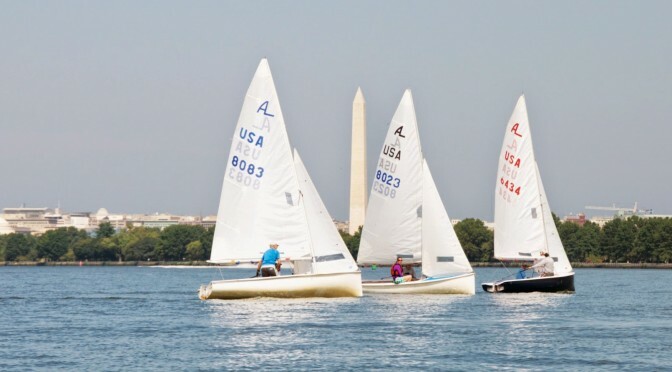 This one-day, one-race regatta will pit all boats in all classes against one another in a distance race around government marks on the Potomac. Portsmouth Yard Stick scoring will be used to determine the fastest PRSA boat on the course. The NOR iand SIs with course options are posted below. Organize your crew and get ready for the fun!